PG · 1h 38m · 1988. Adventure · Family · Fantasy · Romance. André the Giant · Anne Dyson · Billy Crystal · Carol Kane · Cary Elwes · Chris Sarandon · Christopher Guest · Fred Savage · Malcolm Storry · Mandy Patinkin · Mel Smith · Peter Cook · Peter Falk · Robin Wright · Wallace Shawn · Willoughby Gray. William Goldman (book and screenplay). mild language · mild violence. 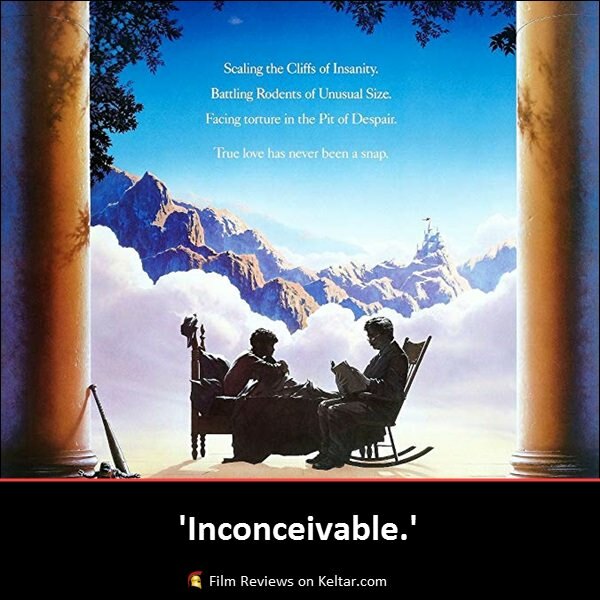 Released in 1987, Rob Reiner's The Princess Bride is a timeless classic. No matter how old you are and regardless of gender, this is a movie that anyone can enjoy. This is a perfect family film, and will probably continue to win over new fans for generations to come. But what is it about this movie that gives it that universal appeal, and has people so enamoured with it's simple story of love and adventure. Based on William Goldman's 1973 novel (who also wrote the screenplay), the narrative is brilliantly framed as a bedtime story. Peter Falks' grandfather is reading to Fred Savage's ill grandson ‘The Princess Bride’. It's an excellent way to introduce the self-aware tone the film will adopt. After some back-and-forth of whether the grandson will like this book, Falks begins his terrific narration to the main story. Set in the kingdom of Florin. The plot follows the exploits of young lovers Buttercup and stable-boy Westley (Robin Wright and Cary Elwes). 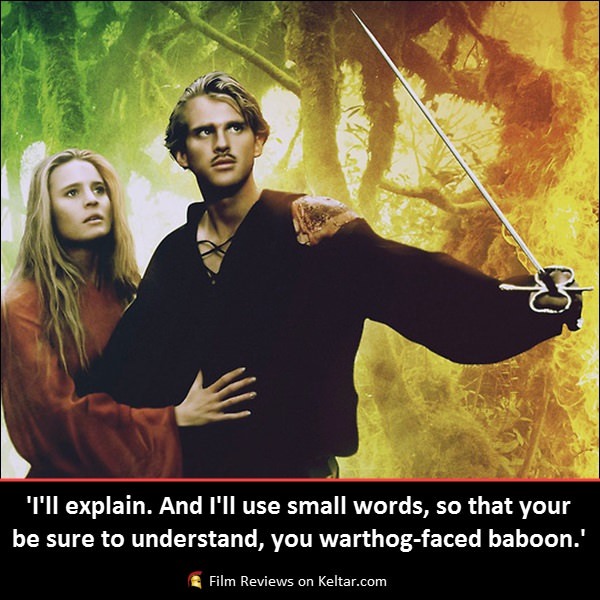 When Westley leaves to make his fortune, he is presumed dead by the infamous Dread Pirate Roberts. Hearing of the tragic news, Buttercup Falls into a deep despair and becomes betrothed to the evil Prince Humperdinck (Chris Sarandon), despite not loving him. 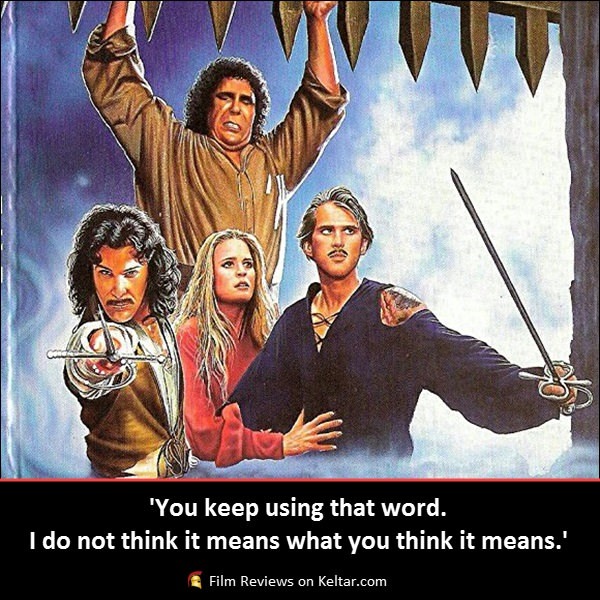 One night, she is kidnapped by a trio of men; mastermind Vizzini (Wallace Shawn), swordsman Inigo Montoya (Mandy Patinkin) and Fezzik (André the Giant). They are pursued however by a masked man who turns out to be none other than Westley. That's as much as you really need to know. If you haven't been initiated into the unadulterated joy that is The Princess Bride, I couldn't recommend it enough. This movie is a delightful viewing experience that has something for everyone. Romance, adventure, fantasy, comedy, drama. Whatever it is you're after, this film has it. Reiner directs exquisitely, balancing these various tones so flawlessly that nothing ever feels out of place or jarring. That humour in particular is also a huge sticking point. By framing it as a bedtime story, Reiner is actually able to bring a meta approach. Like a lot of similar-aged audiences, Savage's grandson is put off by what seems to be a very ‘girly’ book. Straight away, expectations are played around with, and Reiner gets to speak by proxy of the grandfather, asking the viewer to give this story a chance. Even within the main narrative, characters will occasionally break the fourth wall, and everyone seems almost aware that their living out a children's fairy tale. Fortunately, it's not all about genre deconstruction. You'll also be smirking thanks to Goldman's brilliant script, which is full of funny and endlessly quotable dialogue. It doesn't hurt either to have brilliant comedians on screen like Christopher Guest, Billy Crystal and Carol Kane, who all provide great comedic delivery. Combined with some well-timed slapstick and physical comedy, you'll be laughing from beginning to end. If its action you’re after, Reiner has that covered to. Despite the self-awareness, The Princess Bride still works as a solid fantasy adventure. Whether it's superbly choreographed sword fights, horseback chases or mythical beasts, this movie has it all, and is an ode to those classic fairy tales about the triumphant nature of true love. In that regard, the main plot has quite a sincere message at its heart. Filmed around England and Ireland's lush countryside, it likewise has the feel of a sprawling epic. A beautifully realised world and in a time before CGI effects were the norm, it feels tangible and easy to get swept up in. Clearly a lot of the movie's success goes to the on-spot casting. All the actors inhabit their characters perfectly and play off each other really well. Channelling Errol Flynn, Elwes is ideal as the charming Westley, and gracefully slots into the film's swashbuckling spirit. He has a great chemistry with Wright's Buttercup, who is good in her role even if she is a typical damsel in distress. Standing out especially is Patinkin's Montoya, who gets a brilliant dramatic arc, and the best line in the whole film. And although not the best actor, even André the Giant adds a certain charm to his performance. There's a reason why The Princess Bride has stood the test of time. It's a smorgasbord of genres, styles and tones all impeccably mixed together that a variety of people will appreciate. With a fantastically written script, adventurous action and a tongue-in-cheek approach, this is a movie you'll never get tired of going back to. 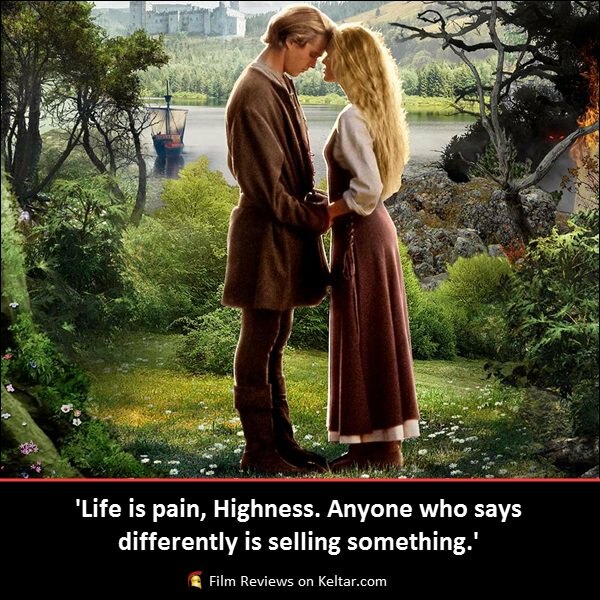 Set in the fairy tale kingdom of Florin. Westley, a farmboy-turned-pirate is on a quest to rescue his true love, the Princess Bride. Review by David Axcell. This article is copyright owned by Keltar Limited. All rights reserved. Plagiarism or unauthorised copying is not permitted. All other copyrights remain the property of their respective owners. Posters, images and quotes credit: The Princess Bride (1987) production and distribution companies. Trailer credit: LionsgateFilmsUK – YouTube.